Who says you have to go out to eat to enjoy a taco pizza? 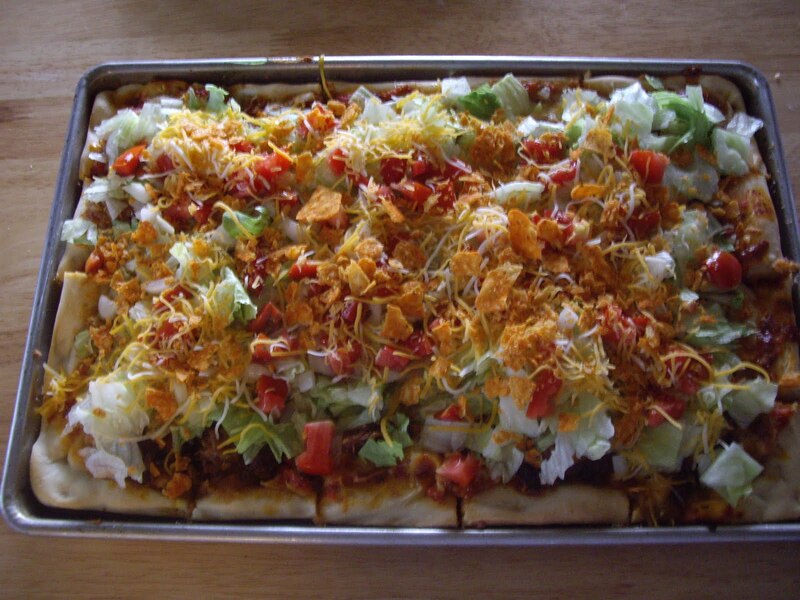 You can make really great taco pizza at home. It’s hot and fresh and oh so yummy. You will need a 11″x 15″ greased pan. Pizza crust dough either homemade or buy a mix or premade. Pat the pizza crust dough into the pan. Spread the refried beans over the crust. Spread the pizza sauce over the beans. Add the seasoned ground beef and the mozzarella cheese. Sprinkle with about half the cheddar cheese. Bake in the preheated oven for 20-25 minutes until the cheese is all melty and starting to brown. Remove from oven and cut into serving sizes but leave in pan. Put the lettuce on the pizza. Add the tomato, some more cheddar cheese, and the nacho cheese chips. Add other toppings if you like. Serve with taco sauce and maybe some sour cream. If you’d like to try a chicken taco pizza, use 2 cups seasoned, cubed chicken breast instead of the ground beef. SO MUCH BETTER THAN ANYTHING YOU CAN BUY!!! NOTHING BEATS HOME MADE!! !